State Road 424 overlays 2.572 miles of Edgewater Drive, from Par Street in Orlando northwest to SR 434 (Forest City Road north / John Young Parkway south) at Fairview Shores. The four to five lane boulevard connects the Dubsdread neighborhood in north Orlando with Lake Fairview, Trotters Park and industrial areas of Lockhart. County Road 424 extends Edgewater Drive 2.056 miles northwest from SR 434 through Lockhart to Beggs Road. Beggs Road leads the unmarked route 0.309 miles west under U.S. 441 (Orange Blossom Trail) to Apopka Boulevard north. Apopka Boulevard was made discontinuous by construction of the John Land Apopka Expressway (SR 414) in 2009. Nonetheless, CR 424 is still applied to the 0.578-mile long Apopka Boulevard spur north from Beggs Road. Apopka Boulevard resumes 4.284 miles northwest from the parclo interchange joining U.S. 441 (OBT) with SR 414 (Maitland Boulevard) through an industrial corridor toward Piedmont. Apopka Boulevard parallels the U.S. 441 corridor northwest by Lake Pleasant through residential areas of southeast Apopka. 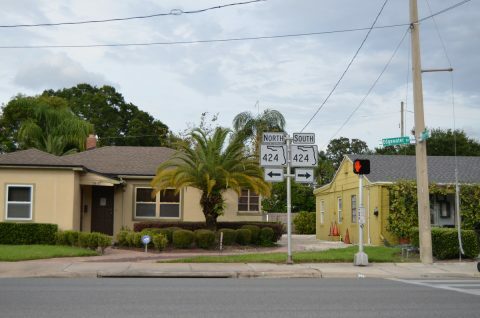 CR 424 turns north 0.458 miles onto Alabama Avenue to connect with U.S. 441 (Main Street) east of Downtown Apopka. The western branch of CR 424 runs along the north side of U.S. 441 (Main Street / Orange Blossom Trail). Separating from Main Street, CR 424 parallels Park Avenue (CR 435) one block west along Central Avenue north 0.324 miles to connect with Orange Street west. Orange Street leads unmarked CR 424 west 0.524 miles to New Hampshire Avenue. CR 424 parallels OBT closely along Old Dixie Highway 2.12 miles northwest to Vick Road, the Parkside at Errol Estates community and Highland Avenue. The county road concludes 0.460 miles west along Highland Avenue at CR 437 (Plymouth Sorrento Road), just north of U.S. 441 and south of SR 429 Connector Road to Wekiva Parkway. The southern extension of CR 424 is an unmarked route continuing Edgewater Drive 1.47 miles south from Par Street to Lakeview Street through College Park in Orlando. Edgewater Drive travels through the business district of College Park to Lake Adair, where it navigates a series of curves from Lakeview Street south to Lake Concord. Edgewater Drive concludes at U.S. 17-92 & SR 50 (West Colonial Drive) by Lake Dot in central Orlando. An east-west branch of CR 424 also links Edgewater Drive and College Park with I-4 and SR 527 via Lakeview Street and Ivanhoe Boulevard. This unmarked segment is 0.800 miles in length. Dartmouth Street west at Edgewater Drive (CR 424) in the College Park neighborhood. Dartmouth is one of several east-west streets named for well known universities. Photo taken 02/18/08.